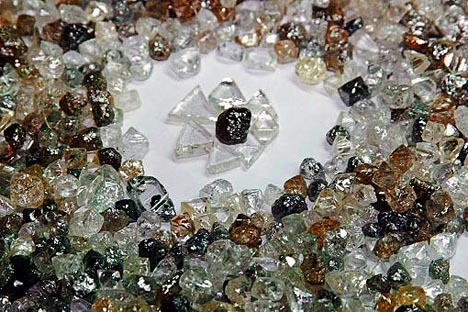 Russia's state diamond monopoly will hold an initial public offering for $2 billion. Alrosa, Russia's state diamond monopoly will be ready to hold an initial public offering by late 2011 for a 20% stake in the company worth up to $2 billion, Alrosa President Fyodor Andreyev said. "The company was valued at between $8 billion-$10 billion. Correspondingly, a 20% stake is worth around $1.5 billion-$2 billion," Andreyev said. The Alrosa supervisory board is to meet on February 22 to set a date for a shareholders' meeting to approve amendments to the company's charter allowing it to hold the IPO. That shareholders' meeting is likely to take place in mid-April, Andreyev said on the sidelines of the Russia 2011 economic forum. A tender may be announced after the meeting to issue mandates to the IPO organizers, Andreyev said. Alrosa could place its shares in Russia or in London, Frankfurt or Singapore, Kommersant business daily said. Alrosa is 51% owned by the Russian government, and 40% by the government of the Russian republic of Yakutia, Siberia. Yakutia's government was allowed to reduce its stake in Alrosa to 25% plus one share, in preparation for the IPO. The capital raised in the offering will be used for the company's development program, including the exploration of the South Yakutian Timir iron ore deposit. The firm plans to spend $8 billion constructing two ore mining and processing plants and a metallurgical complex.